What is this movie supposed to be about? That's not a rhetorical question — I'm actually asking, since Hellboy makes no sense whatsoever. Its so-called "plot" involves Nazis, giants, secret societies, King Arthur, seances, Tarot, and oh so much more. It's been 11 years since the last Hellboy movie, but this film doesn't bother with trying to make us care about the characters. Instead, it drops the audience into an absolutely absurd situation involving the titular monster (Stranger Things' David Harbour) belonging to some sort of a supernatural task force, and a reincarnated "Blood Queen" from the dark ages named Nimue (Milla Jovovich). Normally, this is the part of a review where I would summarize the plot and give a rundown of major characters, except with this film, I don't even know where to begin. Hellboy bickers a lot with his father (Ian McShane) in a World War II bunker; Nimue gets resurrected by some sort of a pig-monster of indeterminate origin; and a young woman named Sasha Lane (Alice Monaghan) has an underdeveloped father-daughter relationship with Hellboy that I suppose we're supposed to be invested in. Characters are introduced at random, like Ben Daimio (Daniel Dae Kim), who belongs to some sort of law-enforcement agency, but also has an army background and seems to be experienced in matters of the supernatural. If this seems confusing, it's nothing compared to the actual movie, with its menagerie of monsters and endless subplots. The mythology isn't so much complicated as it is totally incoherent, and the introduction of Excalibur as a key plot point is particularly laughable. 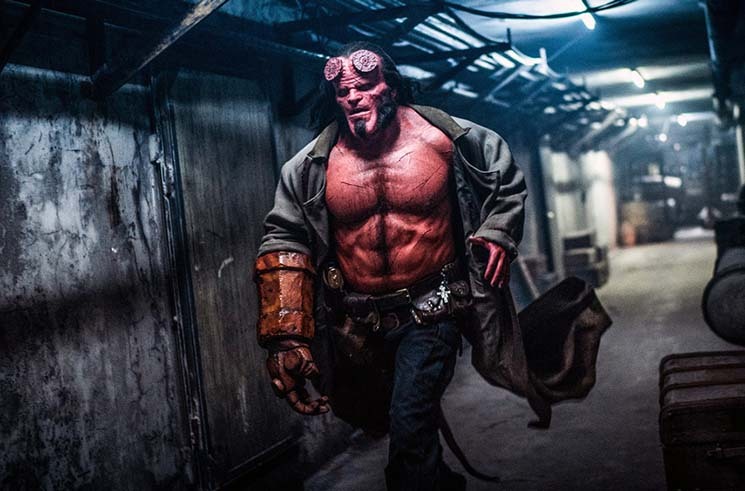 Making matters worse, the ghastly blues rawk song placements and Hellboy's unfunny punch lines mean that it's not even silly in an entertaining way. Hellboy's only redeeming feature is its gore. Baddies and bystanders are ripped in half, torn apart and otherwise disembowelled in a manner that's absurd and just the right amount of cartoonish. The gore would have been even better if Hellboy himself had died a grisly death — that way we might be spared a sequel.